In this post, I’m dropping some truth bombs on four common credit card myths that you probably believe. 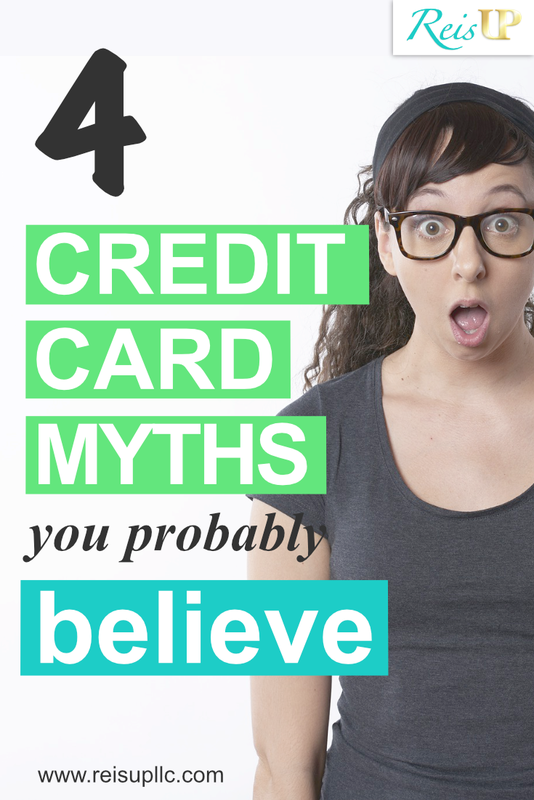 Following these myths could hurt your wallet and/or credit score over time, so take note! The first credit card myth that most millennials, especially, believe is that credit cards are dangerous, and you should therefore only use cash or a debit card for purchases. In the hands of uninformed, purchase-impulsive people who abuse them. When used responsibly, credit cards are a simple payment method that not only offer a variety of potential point and travel perks, but can also help you build and boost your credit score over time. (Cash and debit cards do nothing for your credit score.) Depending on your financial goals, having no or poor credit may be just as dangerous. It may be tempting to close credit cards that you don’t use anymore. However, it’s a bad idea for a couple of reasons. First, the second largest part of your credit score depends on the amount of debt you have compared to how much is available to you. If you close an account, it will decrease the total amount of credit available in the denominator, which could hurt your credit score. The other reason is that closing an old card could shorten the length of your credit history, which is the third largest factor in your credit score calculation. So if you’re contemplating closing your oldest card because you no longer use it, it’s probably wise not to. Just keep tabs on it on your credit report to make sure that no one (especially someone that’s not you) is using your account number. If you’re using a credit card responsibly, terms like the interest rate, late payment charges, etc shouldn’t affect you. However, if you’ve accumulated credit card debt that you need to pay off, you can call your credit card company and ask for more relaxed terms to help you pay back your balance. For example, if you’ve been a good client in the past, you can ask them to waive or refund you for any late payment fees. In some cases, you can get finance or interest charges credited back to you too. You may even be able to get your interest rate lowered so you’re charged less on the balance you owe. It’s all about talking to the customer service representative about your situation, conveying to them that you want to pay this debt back, and asking for some help to do so. I don’t know who is perpetuating this myth, but you should never, ever carry a balance on your credit card. It provides zero benefit to you. It does not help you build credit. All it does is hurt you financially and take more money out of your future pocket. So if there’s one thing you learn from this post, it’s pay off your entire, full credit card balance every month. Do not carry a balance into the next billing cycle. If you do, it’ll still be there next month, but with interest charges. And that interest will compound over time, but not in the good way. Compound interest on debt just digs the hole deeper and deeper and makes it that much harder for you to get back to zero. Were any of these myths surprising? Did you believe any of these myths to be true? Leave a comment below to let me know! Ready to learn more about using credit responsibly, how to improve your credit score, and tackle other forms of debt like student loans, car notes, and mortgages? Enroll in our MONEY course.